This topic explains the inner layers of the earth's crust and how the earth looks like on both the inside and the outside. 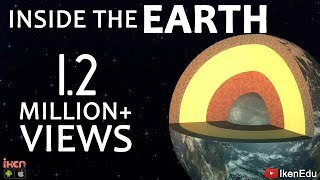 Inside the Earth The Earth's interior is composed of four layers, three solid and one liquid—not magma but molten metal, nearly as hot as the surface of the sun. Echo-sounding techniques are used to explore the Earth's crust. Images, similar to sonograms, are produced. A sonogram in the crust is called a seismic reflection. Scans of Earth's deep interior reveal a vast water reservoir beneath Asia that is at least the volume of the Arctic Ocean. Great documentary, very informative and entertaining. What i do not understand is how nuclear fusion does not occur at the center of the earth. 1 Long ago, people used to think the Earth was flat. They believed if they sailed a boat far out into the ocean, the boat would fall off the Earth!